1- What time did we take this photo? 2- What was the time in real life? (If you look back to the last few times we have done a photo at our desk, you will notice that we were later than usual. This was due to lighting difficulties with our handwritten signs, and so Daniel printed off our cool new ones, that did photograaph). Today it is Mrs Petersen's birthday, and so Erik wasn't allowed out to play. When we went out last Wednesday, we had talked about doing a pre-record on Saturday but he couldn't make that either. Not to worry, The Sunday Alternative soldiered on regardless with Bainy, my friend and colleague from Trent Sound's Wednesday show Notts Live in my passenger seat. This is Trent Sound's first crossover presentation, which we likened to The Jetsons and The Flintstones appearing in the same cartoon, or when you used to spot a character from The Beano in The Dandy. Andy Haynes, Bainy's co-host, now has to do a show with Erik, and we tried to come up with a strategy for mixing up all the shows that are presented by two people, so that we all get to do a crossover show. Castle Rock, (Tuesdays), Notts Live, (Wednesday), Not On Your Telly, (Sunday, before we go on), Cabinet Of Curiosity, (Sunday), and Nottingham LACE, (Saturdays) all need to be mixed up. This might require a big piece of paper and a detailed plan stuck to the wall. We also discussed cover versions, and how they should only be allowed if the person covering is able to re-interpret the song in question. Some of the songs in the setlist below should illustrate our point. With covers a recurring subject, tonight was the debut outing for a new feature on the show titled Louie Smells Like Rock and Roll in which I attempt to play my entire collection of cover versions of 'Louie Louie', 'I Love Rock and Roll', and Smells Like Teen Spirit'. 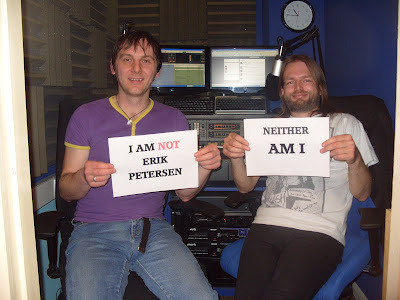 This is of course something that will run and run, but the beauty is that I can take the feature with me when BBC 6Music finally get round to offering Erik and I the Saturday morning slot. I forgot to announce our plans for a Whoopee John tribute band, but as we discussed it in the pub on Wednesday, it perhaps is only fair that I save it for when Erik is back. Funnily enough, Bainy forgot to invite us onto Notts Live for a session. No pies, No Whoopee, Just Me And An Idea!